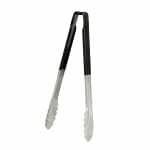 The Vollrath 4781220 utility tongs are durable and strong with their stainless steel construction. Both ends are concave with scalloped edges, making it easy to pick up various product. Made of plastic, the black handle can be used in color-coded areas and stays cool to the touch. Its springless design eliminates areas where bacteria can get stuck and grow.